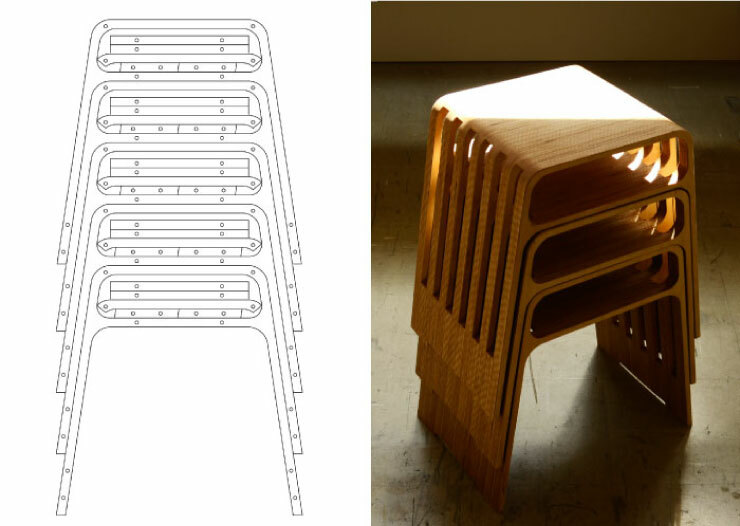 I had been chasing this idea around in my brain for months and months, and then a client approached me (a young Australian, looking to furnish his cafe in friedrichshain with furniture he made himself) with a very similar design, and for me, that was the tipping point. Too often have I discovered that a design I have been “working on” has already been designed by someone else, and if the design is too similar, then I will be the copy cat, regardless of the fact that the idea originated in my head. The interesting thing was that my client had taken his design off the web, so it wasn’t his design anyway. The good thing was that my design was similar, but in a couple of very important points different from that of my client. 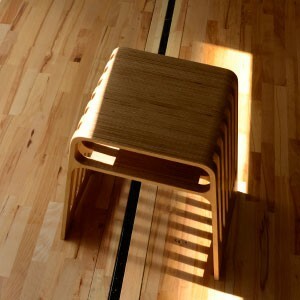 So I did the job for my client, and used the leftover plywood for my own prototype of a stacking stool. 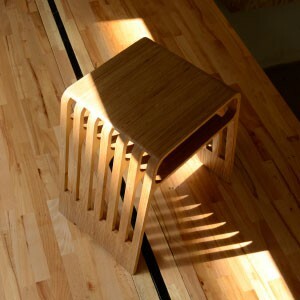 The reason it has a shelf under the seat is not because I thought it would be cool to integrate a shelf with my stool, but rather because I wanted the stools to stack perfectly (which they do). Making them stack perfectly resolves two problems; firstly it adds value to the final product, secondly it saves router time and material. Another advantage of the shelf is that it makes the legs stronger. Is this something that you would share the file for? I’m looking to make something similar for our high school fablab / makerspace. Sign up to receive the newest updates. The service was really friendly and helpful, and was able to accommodate my tight deadline for the project. Walter did an excellent and professional job cutting shapes from Plexiglas for me, the pieces all done quickly with high standards of accuracy. Thanks so much, will be back when I need cutting done in the future! I am very happy for the service given by Formcut during a recent order. Walter, its manager, has been very, very approachable, helpful, precise and reliable in all means. I have no doubt I will contact them again for future jobs as well as I have obviously no doubt in recommending Formcut to whoever might need their services. I was truly delighted by the outcome of services at formcut. 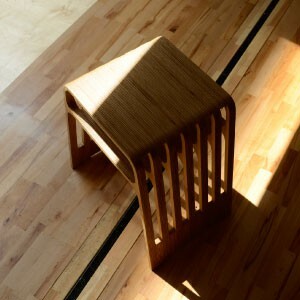 Contrary to my previous experiences with laser/ CNC cutters, where files are received and promptly cut with very little consultation- at formcut i was thoroughly informed about and could discuss the possibilities of material and technique for my idea. and was advised with genuine interest as well as an obvious acquired skill, as to how i could best go about realising my object. For this i was very grateful, and would recommend formcut for those who want to ensure only the best possible outcome for a unique design. you can trust in their skills and knowledge. Durch die Nutzung der Internetseiten von FORMCUT CNC stimmen Sie den allgemeinen Nutzungsbedingungen in informationstechnologischen Systemen und unserer aktualisierten Datenschutzerklärung zu. Mehr dazu unter formcut.de/datenschutz.